Kirell: Bolling bans Michelle Fields from Cashin’ In (via TRS). Wednesday numbers: Bill O’Reilly-Hannity-Megyn Kelly 1-2-3. Tuesday’s numbers: Election/CNN-Elec/FNC-Megyn Kelly 1-2-3. Joe Scarborough responds to griping over his ‘smile’ tweet. Wemple: Mr Bill, Trump’s on-air advisor. Hogue: Dial it down. Baier: After debate nixed, Ted Cruz turned down Fox town hall. Kurtz: Demands that the media ‘stop Trump’ misread the mission. CNN has bought itself Holy Hell. Randall Playton made the grade. Megyn: I wish Bill O’Reilly had defended me more. Parker: More. Q&A: Bill Weir. Flood: The Wonder List is CNN’s break from politics. Rivals of Kathleen Matthews step up criticisms. Profile: Tamron Hall. JJ Abrams gave to Mrs Matthews campaign, Star Wars got on-air plugs. Megyn Kelly to host prime time special on Fox broadcast network. Sunday showdown: Media Buzz trumps Reliable. Weekend numbers. Varney tops CNBC’s Squawk for the week; three FBN shows beat CNBC. Audio Q&A: Bret Baier says Howie ‘could have pushed back’ a bit more. Audio Q&A: Today’s Melissa Harris-Perry gripefest over quitting MSNBC. How CNN raided the competition to up its game. Q&A: Anthony Bourdain. Borchers: CNN was right to talk with stage rusher. Erin McPike resurfaces. Friday’s numbers: Sean Hannity-Megyn Kelly-Cooper 1-2-3. GOP candidate calls for Chris Matthews to be taken off the air. Ariens: Revived Wall Street Week moving to Fox Business Mar 18. Fox News to host March 21 GOP debate…but will Trump show up? Why Chris Cuomo is giving up twitter for Lent. Q&A: Clarissa Ward. TCG: NBC News “report” actually written by MSNBC progressive. Megyn and Trump may have another close encounter. Fields quits. Controversy swirls around CNN interview with man who rushed stage. Reliable Sources: American fascism; American Muslims; time for Trump. Somerby: In Trump discussion Maddow ‘blew right past‘ the key issue. Schram: Chris Matthews at the center of latest (MS)NBC news scandal. Cable Game: A big, fat black eye for Mediaite. Sunday talkers: preview. Jake Tapper, Roland Martin to moderate Sunday’s CNN/TV One town hall. Greta: Use judgment covering Fields. Wemple: What are you talking about? Battaglio: Behind the scenes as CNN goes all in to polish debate presentation. Wednesday’s numbers: Debate-postdebate-Sean Hannity 1-2-3. CNN debate snags 4 million; MSNBC’s Rubio town hall flopped. Chotiner: Coop’s Trump interview a disgrace. Somerby elaborates. Ainsley’s a hit: Fox & Friends viewership jumps with new co-host. HLN is moving Dr Drew. Is CNN fudging identities of terrorists? 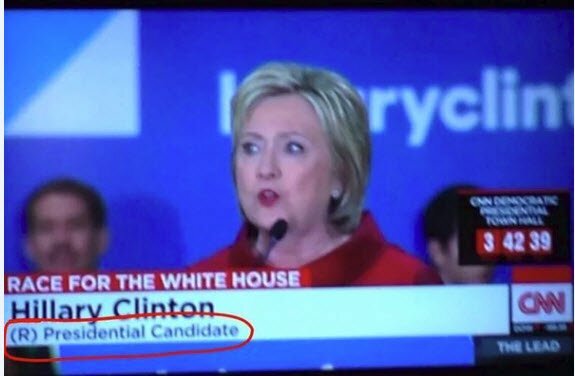 Hillary broke rules at Univision/CNN debate? Q&A: Jake Tapper. Concha: Breitbart’s ‘defense’ of Michelle Fields astonishingly limp. Did Trump aide admit assaulting a former Fox News contributor? Michelle Fields in her own words. Mika B cuts the governor’s mic. NPR audio Q&A: Melissa Harris-Perry. Q&A: Lynn Smith (via CNNC). How cable news outlets restrict the use of their copyrighted material. Fox Dem town hall’s 2.6 million viewers tops MSNBCNN combined. Corasaniti: Fox’s successful town hall may promote thaw with Dems. Grove: FNC forum ‘remarkably civilized‘. Abortion issue finally raised. Sunday Media Buzz tops Reliable. FNC #1 again. Weekend numbers. Concha: CNN acted irresponsibly with its botched Rubio ‘exclusive’. Why did CNN cancel Rubio spox? Trump backed out of Sanders debate. Lafayette: Fox News plans campaign for post-election year revenues. Lead-in boosts CNN’s Race. MSNBC online series focuses on migrants. reacts to Democratic town hall. Steinberg: HLN shelves Heads Up game. Michaela Pereira bounced to HLN. Wednesday is Town Hall Day! 7pm: Greta/Kasich; 8pm: Todd/Rubio; 9pm: Megyn/Cruz; 10pm: Hannity/Trump; 11pm: Megyn/Rubio. Friday’s numbers: Megyn Kelly-O’Bolling-Sean Hannity 1-2-3.
for Marco Rubio’s electoral difficulties? Q&A: Bret on tonight’s town hall, and Repubs who might go for Hillary. Q&A: Bret Baier to ask Hillary, Bernie about topics not talked about. Baier: There are no restrictions from either campaign on the questions. Hannity to host Trump town hall; Greta to moderate Kasich town hall. Steinberg: CNN finds new ways to cram more commercials on screen. CNN debate second-lowest rated of cycle; FNCNN share Saturday honors. Borchers: CNN pundit suggests less information may be better than more. Zurawik: Cheesy re-enactments mar thin, artificial Race to the White House. Irving: The secret of CNN’s turnaround was going ‘all in’ on a missing plane. Updated 4:47 pm Use our valuable bandwidth to post your cable news comments in today’s open thread. Reliable Sources: Debate in Flint; the right chooses sides; off the record? Cable newsers break Nancy Reagan news as rolling coverage continues. Fox newsers moonlighting in House of Cards. Sunday talkers: preview. Tonya Reiman resurfaces. Crankshaw: CNN sells its soul. Today’s oops. Saturday coverage rundown. Trump camp broke rules ‘at multiple debates‘. Ainsley Earhardt’s ‘American dream‘; her first week spurs F&F ratings bump. Updated 4:03 pm Use our valuable bandwidth to post your cable news comments in today’s open thread. Hillary Clinton will participate in the Fox News town hall. Concha: Gawker’s voicemails story is ‘complete and utter crap‘. Voicemails reveal Trump’s cozy relationship with MSNBCers. Concha: Fox earns an A+ for impeccable debate performance. Fox debate most watched of 2016, snagged 17 million viewers. Wemple: O’Reilly post-debate show an embarrassing debacle. Wemple: Fox News finds the key to stopping Trump…graphics. Koblin: Megyn’s ‘intense interrogation‘ of Trump avoided hostilities. Zurawik: Fox turned GOP debate into an inquisition of Donald Trump. Fox moderators ‘the best’, ‘pressing candidates‘ with ‘tough questions’. Smith: Geraldo will compete on season 22 of Dancing with the Stars. MSNBC caught photographing Fox event. MSNBC goes to the dogs. Bauder: Exit of Melissa Harris-Perry raises diversity issues at MSNBC. Q&A: Clinton compadre Kevin Spacey and The Road to the White House. On Monday Bret Baier to host Bernie Sanders Detroit town hall. February 2016 program ranker: Fox News holds top 14 slots. Bret Baier: Expect Michigan questions, and probing for specifics. Moderators discuss roles, prep; more. Instagramming. Debate dossier. Chris Wallace wants an elevated debate; Megyn not looking for trouble. Moylan: Viceland’s CNN-style programming targets male millennials. Durkin: CNN’s Road to the White House is year’s best political series. Q&A: Melissa Harris-Perry; Wemple is still lamenting her cancellation. MSNBC Profiles: Chuck Todd, Chris Hayes, Kasie Hunt (via TV Newser). Shafer: The media didn’t create the Trump phenomenon…the public did. TCG: Sherman’s latest Ailes/GOP meme is the shortest-lived meme ever.